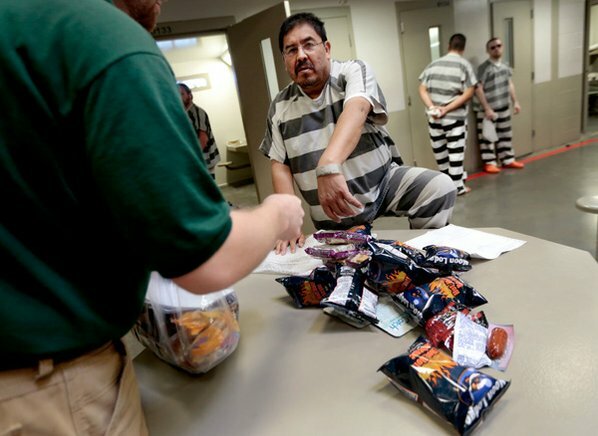 5NEWSOnline reports that Benton County Jail will continue to provide only cold meals to its inmates for a variety of reasons, all of which are absurd and wildly offensive. Mistreating prisoners because you think they’re “there for a reason” is not only an opinion ignorant of the various reasons why people end up in prison — just and unjust — it’s also immoral. The courts may have found that cold meals are not constitutional violations of a prisoner’s 8th amendment rights, but some states have outlawed them. However, in Rhodes v Chapman, the courts found that while prisoners are “not entitled to luxury or ‘comfort,'” facilities must be run in a “manner “compatible with the evolving standards of decency that mark the progress of a maturing society.” With such disagreement between states, I’d say the jury is still out on this one. The bottom line is that this view of prisons and prisoners is what allows their abuse to continue unchallenged. Laws and courts are not inherently just, and not everyone in jail has been convicted of a crime. This is a vile case of buck-passing and victim blaming. If the Benton County Jail were to go from serving cold meals to hot meals, they would need new equipment. That would come at a price tag of between $30,000 and $40,000, Guyll said. Food costs would add another $100,000. Benton County just bought $2 million worth of military equipment from the federal government to police a small city. Even if it was at ‘substantially reduced cost,’ I find it hard to believe they had the money for their high-tech toys and not for decent meals for prisoners. And when you’re already feeding prisoners unhealthy food on $1-2 dollars per-meal, per-day, there’s no need to target such a necessary component of survival for budget reduction. We don’t even treat farm animals destined for slaughter this way. I don’t know who this registered dietitian is, but my basic understanding of nutrition is that people survive off more than just calories. And not all calories are good for you — such as those ’empty’ calories found in much of the junk food available to prisoners in the commissary, which they then often substitute for mess hall food thats unpalatable. This asinine focus on calories and nothing more is why so many prisoners suffer declining health in prison. So what will it take to convince the sheriff’s office to feed prisoners palatable, digestible meals and not torture them with cold slop full of empty calories? “If the laws change and the rules change to where they mandate that county jails serve hot food, we will absolutely do that,” she said. Click here to find contact information for Bentonville city council and the mayor and let them know this disgusting abuse of prisoners must end immediately.